A FIST SLAMMED into Aaron Buckley’s right cheek, blinding him with a blast of white light and knocking him to the cold tile floor of the boys’ restroom. He scrambled back on his hands and feet on the slippery surface like a crab frantic to return to the safety of the ocean. Jeffrey Beagle loomed over him like a predatory gull, his face flushed and distorted with fury. Had the kid grown a few more inches in all directions since the last time Aaron was confronted —the day before? His attacker’s followers positioned behind him, bobbing their heads for a good view of the beating sure to continue. Reaching the wall, Aaron pushed himself upright. Although tempted to touch his face, he refrained, for fear the gesture would demonstrate weakness. Man, was he weak! His body numb from head to toe, he wanted to curl into a fetal position and sob. But he refused to give Jeffrey the satisfaction. In the fifteen years of his existence, Aaron had never been punched before. In fact, he never thought that he’d survive a real punch. Never thought he’d have to. Jeffrey hadn’t ever punched anyone before, until today. At least, Aaron never witnessed such an event. Yet, here they were, and Aaron survived it. Barely. White hot pain gripped the side of his face, and he feared a broken tooth. But part of him was gratified by his newfound strength to survive, while another part was deathly afraid of a follow-up blow. Threatening tears burned. Do not cry. Aaron pulled his stare from his enemy; dragging it to a tall, skinny, blond-haired, blue-eyed boy he’d once known, now standing among Jeffrey’s entourage. Ashton. His gaze already on Aaron, Ashton dropped it to the floor. “You can’t run, Freckles, so why even try?” Jeffrey closed the gap between them. Twisting his face away, Aaron attempted to avoid the stench of the boy’s breath but failed. A shove knocked Aaron off-balance again but not enough to throw him to the floor. His heart hammered faster, his body chilled, and fear paralyzed him as he awaited the bully’s next move. Shielding his face with his arms, Aaron slouched his shoulder and lifted a knee, all in defense of what was to come. A fake. Followed by laughter from the followers. What a bunch of hyenas. Aaron straightened, lifting his chin to save some face. Don’t cry. He wished he had the nerve to comment on Jeffrey’s horrendous breath. The fantasy was likely more satisfying than the reality of another punch. No thanks! A silent stare-down was all he could muster, clamping in a gulp of clean air that he released ever so slowly. Scratching his short blond head with thick fingers, Jeffrey tossed a glance back at the followers, who laughed harder with every roll of the bully’s eyes. “What a loser.” He rubbed his chin on his shoulder—a gesture that reminded Aaron of a boxer in the ring, ready to fight. Please don’t punch me again. Still reliving the sting of impact, and desperate to avoid another, he resolved to keep his bad breath comments to himself. If he just waited the moment out, maybe the crowd would get bored. Another shunt to Aaron’s left shoulder slammed it against the wall. Obviously a last attempt at instigating something more exciting. The move resulted in an involuntary cough that released the reserved air from Aaron’s lungs. He spun away, doubling-over, with his suffering cheek pressed against the icy tile wall. The chill calmed the pain. Each follower thrust him in turn as they marched past, except for Ashton, whose gaze clung to the floor. Aaron understood very clearly that the followers’ confidence existed only because of their leader’s. If only he’d had the courage to redeem himself with a smart comment . . . You’re so tough when you have your followers protecting you, he imagined himself saying. Let’s see how tough you are standing on your own. Then what? Who was he kidding? He couldn’t take Jeffrey by himself. The bully outweighed him by fifty pounds. The door shut. Aaron waded through the remnants of gross restroom air, stumbling to the sink. The red-headed, freckle-faced boy frowned at him in the mirror. He scowled back. His cheek was red, knuckle shaped indents slightly visible, but his teeth were still intact, and the punch hadn’t broken the skin or caused his mouth to bleed. So that was good. Although no contusion could make him look any worse than he did naturally. He considered himself the perfect illustration of the red-headed step child cliché, without being the step-child, that is. He hated that he was so skinny. He hated his copper-colored hair. And he hated his pale white skin that had no other option but to turn crimson and peel in the sun. Nature had handed him his mother’s looks, and although very complementary on her, they clashed on him in every way possible. Leaning into the mirror, he took a closer look at his nose which had been sprinkled generously with freckles by an overzealous pepper grinder. “Freckles,” he muttered, combing his fingers through his messy, medium length hair, shaking strands casually over his wound, hiding nothing. Great. Mom’s gonna love this. With one class remaining for the day, Aaron chose to stay hunkered in a restroom stall, reliving the embarrassing specifics of the confrontation. Replaying the details with more courage and strength, the outcomes were way more enjoyable. If only. Minutes before the bell rang, he slunk into the corridor, just in time for the classroom doors to burst open, spilling loud, animated kids out around him. His backpack slung over his shoulder, his gaze running along the floor, he weaved through the mob and out the main entrance. His journey home took him through Main Street. Still marching with his head low, he glanced up randomly, avoiding potential collision. A door opened ahead of him. Pausing to allow a small group of kids to exit, he peered up instinctively, reading Yeungs Chinese Martial Arts on the sign above the door, before moving on. But after a few steps, he stopped again. An odd sensation nagged at him, drawing him back. You need a plan? Really? Martial arts? The two sides of his indecisiveness bickered back and forth while he loitered outside the door. It opened again and a tall teenager—he guessed around seventeen—with a short blond crew cut and a strong jaw stepped out. Wearing black martial arts pants and a black tee bearing the school name in white, Aaron couldn’t help but notice and admire the teen’s strong muscular arms. Those must surely come in handy. The teen’s glance shifted to Aaron as the door shut behind him. After a long awkward stare, the teen stepped aside, pulling the door open. “You’ve come to the right place,” he said, a smile softening his face. Aaron stepped back, adjusting his backpack and instinctively turning to leave. Aaron touched his fingers lightly to his cheek. Then, without further deliberation, he stepped inside. 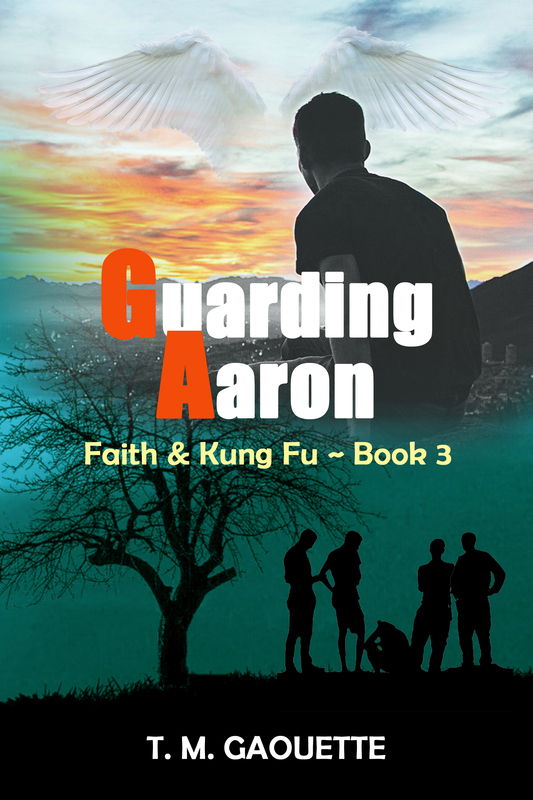 Guarding Aaron is available at Amazon and TMGaouette.com. Or ask for it at your local or online bookstore!